I am a sucker for a good pancake, and even more so when it’s nutritious. 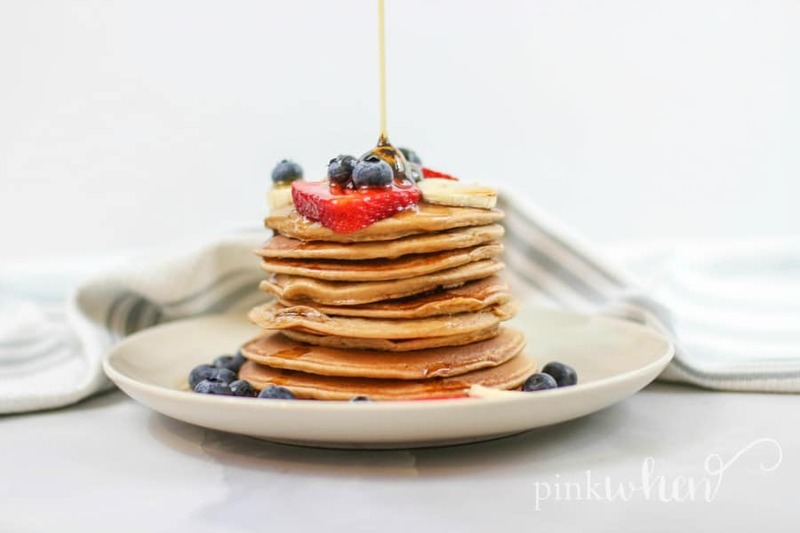 This simple protein pancakes recipe is so delicious and super easy to make. It’s almost like dessert but for breakfast. You just need a few ingredients, a good blender, and a hot skillet! Check out the video of this recipe below. It’s no secret that I like to share yummy recipes and delicious desserts, but I also like to share nutritious recipes as well. I know a good lifestyle is one that is built upon moderation and good food choices with good recipes. 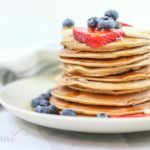 If you are looking to add a little more protein to your diet, you’re going to love this protein pancakes recipe. Protein pancakes are a lot healthier than your average pancakes recipe. No flour or scoops of sugar involved. They are made with healthy banana, greek yogurt, protein powder, your favorite fruits, and more. The best part? 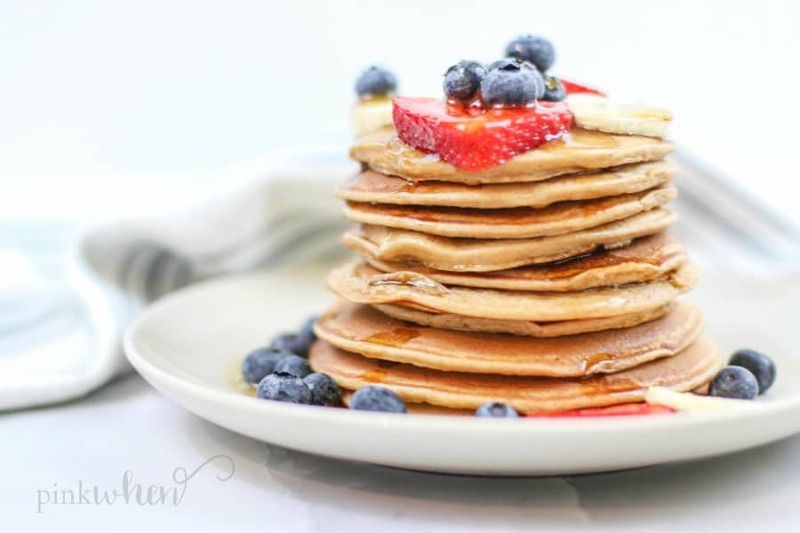 You are gaining healthy protein without sacrificing the flavor of a delicious pancake! There are several ways to make protein pancakes, but this is one of my favorite ways. They turn out DELICIOUS and taste like a dessert, You won’t believe how easy these are to make. In fact, you can watch my full video tutorial below and see just how easy they are to make. I’ve made several different pancake recipes over the years, but this is by far one of my favorites. 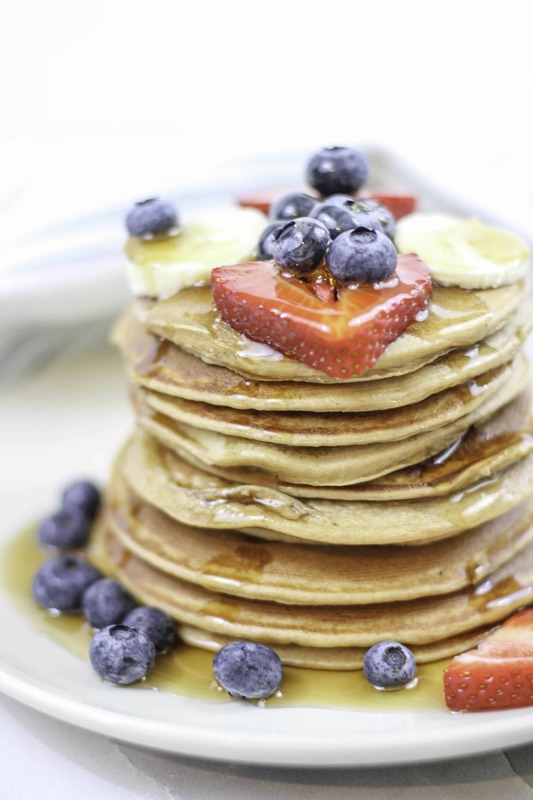 These protein powder pancakes will add some extra flavors to an already amazing recipe. Here is a list of ingredients that you will need for this banana based protein pancake recipe. Grab all of your ingredients along with the protein powder and place them into a blender. I like to use Premier Protein because it is 100% Whey Powder with a great nutritional profile: each scoop contains 30g of protein, 180 calories and 3g of sugar. Set the blender for a one minute blend to get all of the ingredients mixed well together. Once everything is blended well, set aside and allow the protein powder pancakes mixture thicken over 2-3 minutes. Heat the skillet, and make sure to let the skillet get very hot before pouring the batter. Once the skillet is hot, start pouring small to medium sized pancakes. 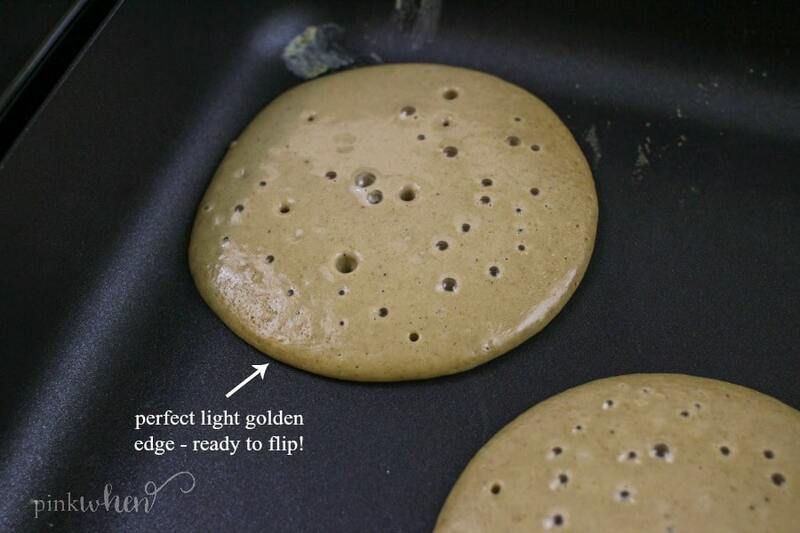 Don’t flip the pancakes until the batter has started forming small bubbles on the edges, and the edges start to turn a light golden brown. This should take approximately 1 and 1/2 to 2 minutes. Flip the pancakes over and allow them to cook thoroughly on the other side. After all of the pancakes are finished, top with your favorite toppings and a little maple syrup. This recipe will make 10 pancakes, so you can serve 5 people 2 pancakes each! Can Protein Pancakes Help You Lose Weight? The simple answer is yes. The protein may help boost your metabolism, which helps you burn calories. Those calories, once added up, may help you lose weight. How Do I Store Protein Pancakes? You can make these protein pancakes and store them in the refrigerator for up to 3 days. 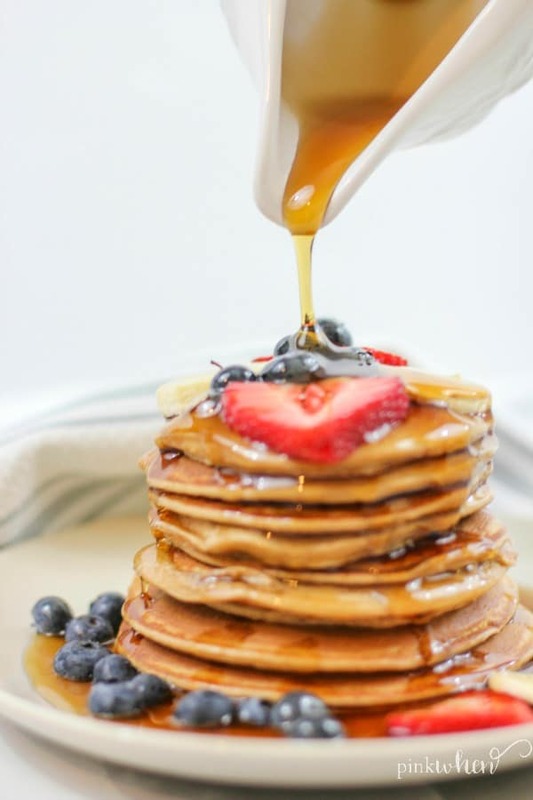 I love to make large batches of these pancakes and eat them throughout the week. These high protein pancakes are a healthy version of your regular pancake recipe. They are made WITHOUT flour or added sugar, and instead use quick oats, banana, and greek yogurt. What is your favorite way to grab a little extra protein in your diet? Premier Protein powder provides that extra protein your body needs to fuel lean muscle and to burn fat. Not only that, but it blends easily and doesn’t leave a chalky taste like some other brands. Blend it, mix it, or bake it! 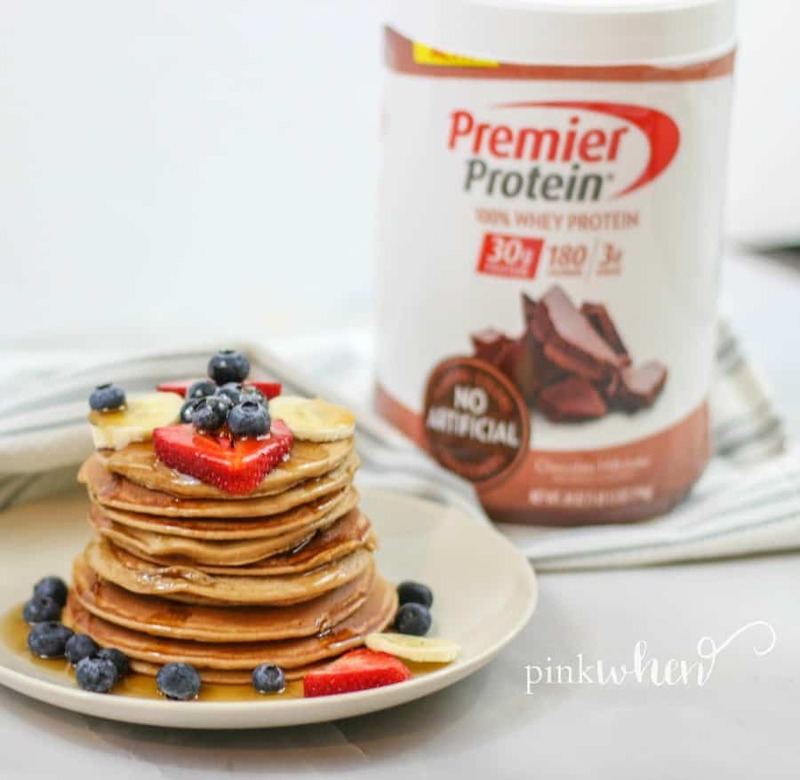 Don’t forget to give us 5 stars in the comments below if you love this Protein Pancakes Recipe as much as we do. A delicious and easy protein pancakes recipe that the whole family will love. 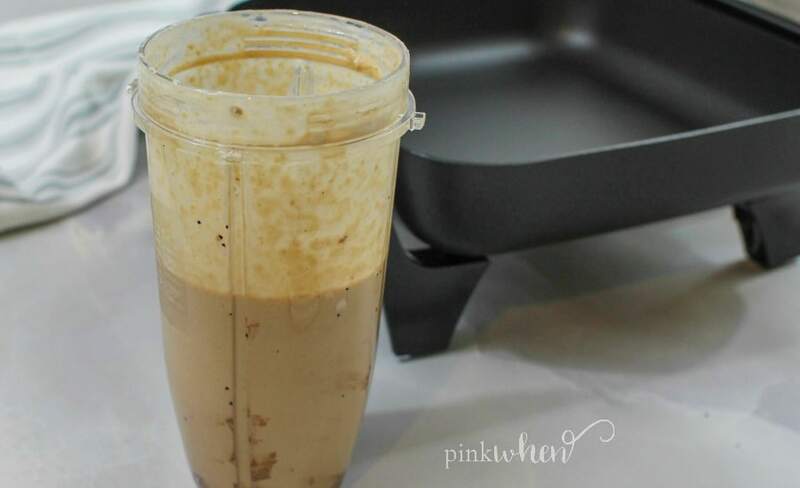 Grab all of your ingredients and the Premier Protein powder and place them into a blender. Set the blender for a one minute blend to get all of the ingredients mixed well together. Once everything is blended well, set aside and allow the protein powder pancakes mixture thicken. Once the skillet is hot, start pouring small sized pancakes. Don't flip the pancakes until the batter has started forming small bubbles on the edges, and the edges start to turn a light golden brown. This should take approximately 2 minutes. Don't want to serve with fruit? Serve with chocolate chips or top with almond butter. 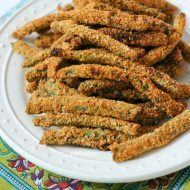 Make a large batch and store them in the refrigerator in a sealed storage bag for up to 3 days. 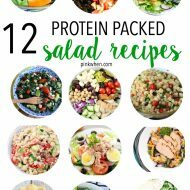 What a great and delicious way to get some extra protein in! I can’t wait to try this! I struggle with getting enough protein! These pancakes look incredible! What a great way to start the day! I love that this breakfast gives you enough fuel to get through the morning. Ok my kids are totally obsessed with pancakes… and I am too! 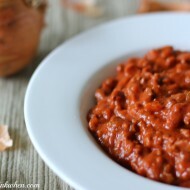 I love this recipe, and am totally making this version sometime! ?? Thank you! Looks so easy and delicious! Love protein pancakes! Oh I would LOVE to try these out!